Ars Prosa: Kafka. . . Borges. Benjamin . . Bloomberg? Jon Stewart's recent interview of Michael Bloomberg (which you can watch here) began with an interesting interaction between the two. 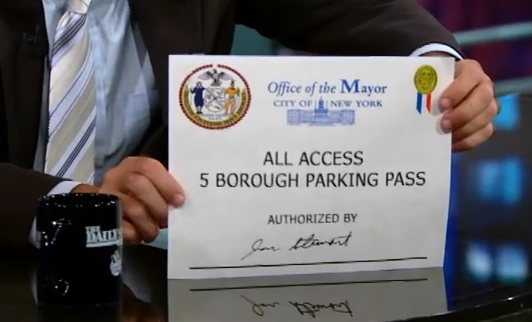 Stewart asked the mayor for his autograph, which Bloomberg dutifully provided, leading Stewart to reveal that what he had actually signed was an "all access 5 borough parking pass." At this point Bloomberg told Stewart to look at the name he had signed, which turned out to be not Michael Bloomberg, but Jon Stewart. I'm not certain how much of this little scene was planned, and perhaps it's even more telling if it wasn't, but for me it had an immediate, albeit initially hazy, literary echo. the room was not locked. In semidarkness Potemkin was sitting on his bed in a threadbare nightshirt, biting his nails. Shuvalkin stepped up to the writing desk, dipped a pen in ink, and without saying a word pressed it into Potemkin's hand while putting one of the documents on his knees. Potemkin gave the intruder a vacant stare; then, as though in his sleep, he started to sign—first one paper, then a second, finally all of them. When the last signature had been affixed, Shuvalkin took the papers under his arm and left the room without further ado, just as he had entered it. Waving the papers triumpantly, he stepped into the anteroom. The councillors of state rushed toward him and tore the documents out of his hands. Breathlessly they bent over them. No one spoke a word; the whole group seemed paralyzed. Again Shuvalkin came closer and solicitously asked why the gentlemen seemed so upset. At that point he noticed the signatures. One document after another was signed Shuvalkin . . . Shuvalkin . . . Shuvalkin. . . .
To make his horror complete, Caesar, pressed to the foot of a statue by his friends' impatient daggers, discovers among the blades and faces the face of Marcus Junius Brutus, his ward, perhaps his very son, and so Caesar stops defending himself , and cries out Et tu, Brute? Shakespeare and Quevedo record that pathetic cry. Destiny takes pleasure in repetitions, variations, symmetries. Nineteen centuries later, in the southern part of the province of Buenos Aires, a gaucho is attacked by other gauchos, and as he falls he recognizes a godson of his and says to him in gentle remonstrance and slow surprise (these words must be heard, not read), Pero, ¡che! He dies, but he does not know that he has died so that a scene may be played out again. This, in turn, is also the main concept behind James Joyce's Ulysses , where the events of one day in the life of a pudgy and unheroic Jewish man echo Odysseus's epic journey (and, in case you're wondering, it is for this reason that I gave this post its title, a reference to Samuel Beckett's essay on Joyce: "Dante . . . Bruno . Vico . . Joyce"). Turns out that while the name is spelled 'Potemkin', the 'e' in certain spelling positions, and often then written with an umlaut on top of it, is not pronounced as 'ehh', but 'oyyy', hence the two forms of transliteration, FWIW.